Stem: many, 1--3 dm, unbranched, curved-ascending. Leaf: oblanceolate, 2--25 cm, lightly to densely stiff-bristly-hairy. Inflorescence: heads generally 1, nodding in bud; involucre 6--12 mm, glabrous to bristly; outer phyllaries short, +- linear, main phyllaries +- equal, linear to narrowly lanceolate. Flower: corolla 8--15 mm. 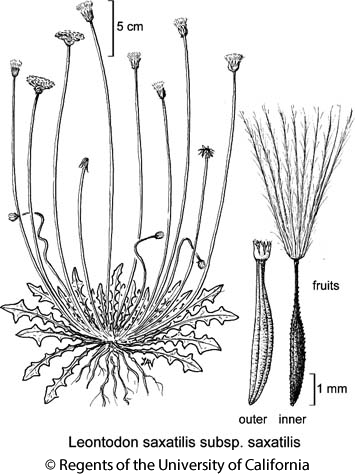 Fruit: outer fruit smooth, pappus a crown of short, fringed scales; inner fruit roughened, pappus of short and long plumose bristles with expanded bases. Chromosomes: 2n=8. Synonyms: Leontodon taraxacoides (Vill.) Willd. ex Mérat subsp. taraxacoides, illeg. Citation for this treatment: Kenton L. Chambers 2012, Leontodon saxatilis subsp. saxatilis, in Jepson Flora Project (eds.) Jepson eFlora, http://ucjeps.berkeley.edu/eflora/eflora_display.php?tid=82195, accessed on April 22, 2019. NW, n SNF, CCo, SnFrB; Markers link to CCH specimen records. Yellow markers indicate records that may provide evidence for eFlora range revision or may have georeferencing or identification issues. Purple markers indicate specimens collected from a garden, greenhouse, or other non-wild location.